I awoke to the sound of flapping. The room was dark and I couldn’t see very far, but the sense of motion around my head was unmistakable. Just then, a flash of a tiny winged creature with outstretched wings, and then it was gone. We searched all over, but there was no sign of anything out of place or alive. Could have been a bug of some kind? A bird? I chalked it up to a rough night, or maybe I was just hearing things. The next night, I was again awoken to the sound of flapping. I cautiously sat up to find a creature circling above our bed. I attempted to wake up my sleeping partner to no avail. It flew around the room a few times, then into the hallway, and it didn’t return. I went back to sleep. Again our searches turned up nothing. No droppings or cracks in the windows or doorways. I wasn’t sure what to think, honestly wondering if I was hallucinating the whole thing. That night we were sitting on the couch watching some television. It was 10:30, later than we were normally up. I heard a small thud by the fireplace, and I looked over and saw movement. Tiny little arms attached to a mouse sized body, crawling up the fireplace screen. When it reached the top it looked at us, just before it took flight, right into our home. Upstairs, downstairs, back up again, it flew everywhere. I was opening doors, closing doors, trying to recall everything that I read on the internet. Make the room dark, open a window, and let it leave naturally. At one point we were fairly positive it was downstairs, so with a towel held up near my head, I slowly approached the kitchen. No sign. Den, no sign. Living room, nothing. It was gone again. We decided it went back in the fireplace after we hadn’t seen it for several minutes, so I went about closing off the opening as best I could, using the metal screen and a whole lot of duct tape. Watching the bat watch us just before it took flight was unnerving, but we hoped it got the message. This isn’t a good place to fly, and now the fireplace was blocked off, so we just hoped that it was able to crawl back out however it got in. 6:30, the next night, another thud, more movement, and a tiny bat, crawling around our fireplace again. By that time we had named him Bruce, and my barrier was clearly working, he wasn’t able to get out, but wasn’t shy about trying either. At this point we knew we had to get rid of the animal. It was clearly either stuck in the chimney, or had become so fond of our house, that it couldn’t resist coming back again and again. Raleigh Animal Control told me they couldn’t come out because the bat hadn’t been in contact with humans. I found a local company that specializes in situations like this, and they said they could be over in an hour. 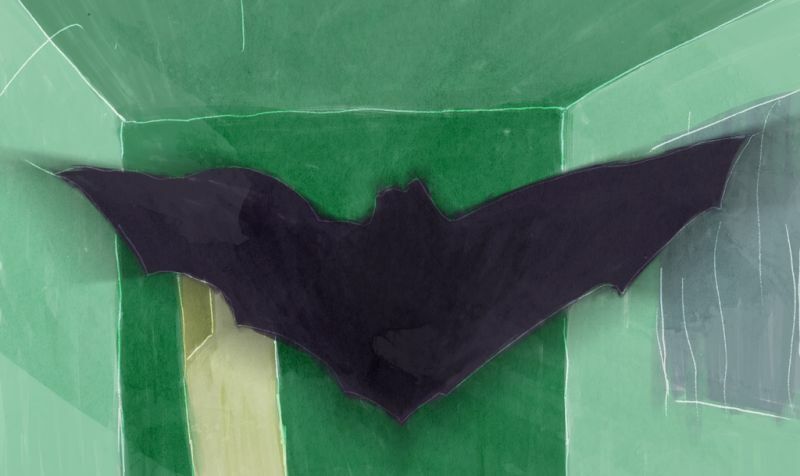 During that time the bat was up and down and all over the inside of the fireplace. When the professional arrived, we briefed him on the situation, and he went on the hunt. He cleared out all the logs in the fireplace, moved around the gravel, searched up inside the chimney, but no bat. For nearly an hour he searched and found nothing. He recommended I put the barrier back up and call him if it came back. 9:45, Bruce was back. I didn’t feel right dragging the guy back here the same night he left, so we just went to bed, shutting the bedroom door just in case. Monday morning I was awoken out of bed. He was snuggled under the barrier, on the outside of the fireplace in the brick area. We called the professional again. This time Bruce stayed. He screeched as he was put into a small tupperware container with a green lid. He will be tested for rabies, and then set free. I was in Wisconsin the first time I had to deal with mice. The South has shown us mice, cockroaches and ants. Bruce was our first bat, and he won’t soon be forgotten.